An attractive driveway can transform your home's looks, appeal, value and make it more practical too. 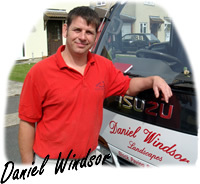 At 'Daniel Windsor' we can provide a tailor-made, beautiful driveway that will last for generations to come. We offer the choice of both classic and contemporary driveway surfaces, in a wide variety of different styles and colours. If you have a design in mind, you can customise your drive with patterns and extras such as kerbs & steps. We use 60mm deep paving blocks, thicker than most companies, so our driveways are more robust and less liable to crack and dip, even years down the line. Sealing of driveways is also something we can do for you, this not only enhances the appearance of decorative concrete by improving the gloss and colour. It also extends the life of your driveway by preventing moisture problems and makes the removal of stains much easier should an accident occur. We specialise in all types of paving; Patios, Terraces, Paths and Walkways. Our paving installations are completed to the finest quality, using high quality paving slabs and materials. By using 60mm deep paving blocks, thicker than most companies, our paved areas are more robust. All our products are laid on a recycled subbase of crushed concrete and covered using Limestone type 1. This provides a strong, secure foundation to the paved area, and will prevent subsidence, dips and cracking. In addition, all our paving cuts are made using professional, precise, diamond cutting tools to give the the best possible finish. For your top patio stone work we can lay anything from Granite to Porcelain and anything in-between. Additionally we can add carpeted areas and artificial lawns for areas you wish to keep low maintenance. We are specialists in Hard Landscaping, and our services in this area include planning & design, drainage, paving, decking, walls & fences, decorative stones, bed areas and the supply of hard landscaping materials. Materials that we can work with when landscaping include brick, gravel, stone, concrete, timber, bitumen, glass, metals, soil and turfing. We can also provide artificial lawn in addition to turfing of which you can find more by going to the Lawns & Gardens link below. Our prices are very competitive because we buy our material in bulk, and are able to pass on this saving to you, the customer. In addition, we own all our own machinery & tooling, so do not pass any as hire charges as some other companies will do. We are able to supply, fit, build & repair most fences and walls, using either brick, stone or wood. We have negotiated excellent rates from our local timber supplier, and use only treated woods from sustainably managed forests. We have many different styles from traditional garden fence panels, to modern divider fences to help break up your garden into different areas. From custom parking areas to offer privacy when leaving your home to creating a garden that opens up with strategically placed fencing. Fences can be much more than simply separating yourselves from your neighbours, it can create new spaces and promote a little more secrecy for yourself. The garden is a beautiful place to be, as long as you have a beautiful garden! Daniel Windsor Landscapes can completely rebuild your garden to your dream specification, or breathe some fresh, vibrant life back into it if your on more of a budget. We are specialists in hard landscaping, which means that we can re-model your garden and add features such as paving, patios, paths, decking, walls and landscape modeling. In addition, we can supply and lay a wide variety of different turf for your lawn area, including anti-drought turf and very fine turf. We can also include other materials to give your garden more character by using, porcelain, granite with a mix of natural stone to really bring some variety to your personal space. Coupled with our excellent quality patios with extra durable block paving stones and a decking area. We can completely transform your garden and add personality to your home. 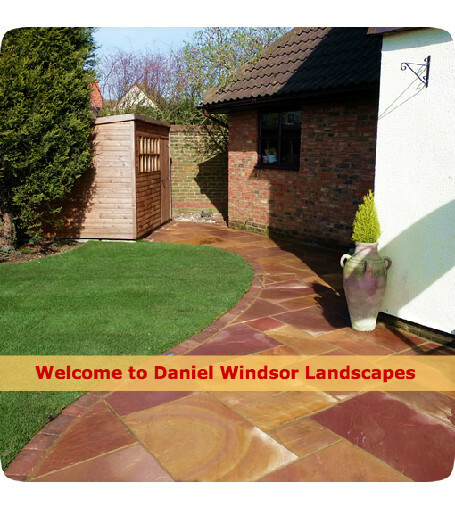 Daniel Windsor Landscapes is a family run business, established in 2000 and based in South Woodham Ferrers in Essex. "We are a small company, with a close-knit team of friendly, professional & dedicated staff. We take the greatest pride in our work, and I am very proud to say that we have a large number of very satisfied customers." Daniel Windsor Landscapes has full AXA public liability insurance and are members of the Brett Approved Installer Scheme. Brett is one of the largest independent construction and building materials groups in the UK. 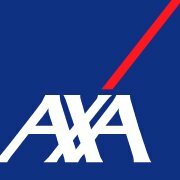 We have full AXA public liability insurance. "Thank you for the extremely good job you made of our driveway. Although delayed because of weather conditions, you and your team worked professionally and aided us in our selection of materials & design, to give us a driveway to be proud of." Clive & Brenda Pritchard, Brentwood. "Daniel and his team are fantastic! My new driveway looks fabulous and I highly recommend them." Daniel Simmons, Chelmsford. "I am so impressed with the patio that you laid last month." Mr P.C. Lee, Tiptree. "A great job, completed on time and on budget - Good work!" James Barry, Hornchurch. "Lots of people have commented on our new driveway and fencing, and we wouldn't hesitate to recommend you to other people for future jobs." Clive & Brenda Pritchard, Brentwood. "Thank you very much for doing such a good job with the garden landscaping - the whole process was stress free and the results amazing." Sarah Cox, Basildon. "Very pleased with the driveway that you laid last month." Mrs Forester, Essex. "You completed work on my parents house recently, and after viewing the paving work, I have to congratulate you on the exceptional standard of work." Mr Bankcroft, Stanway. "A very nice job and reasonable price too - many thanks." Samir Bassu, Wiltham. We have all heard horror stories about the problems caused by rogue contractors. We are registered members of the 'Brett Approved Installer Scheme', a network of installers whose work is assessed by Brett to guarantee the quality of service and workmanship. You can click the BRETT Logo above for more information on BRETT installers. Write to us: 80 Hullbridge Road, South Woodham Ferrers, Chelmsford, Essex, CM3 5LJ. Or complete our Contact Us Form. © Daniel Windsor Landscapes Ltd.